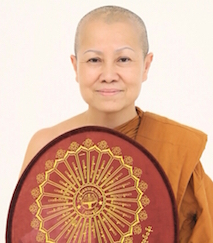 Bhikkhuni Nattha Vivatta was born in 1954, and graduated from primary school at St. Francis Xavier Convent School. She studied high school at Ampornpaisarn School, and a Bachelor’s Degree in Business Administration from Ramkhamhaeng University. She also made studies in the USA. Bhikkhuni Nattha Vivatta married with Mr. Dech Bun-long, Deputy Prime Minister of Thailand and Minister of Transportation. In 1999, she started training in higher morality, with Master Suchart Nark-orn in Dhamma Sikkha with Jaturasridhi Dhammakhanta Theravada. In 2003, Bhikkhuni Nattha Vivatta ordained at Bhikkhuni Patimoka Dhamm Abhidok Mahavihan Temple with VenerableVimalachoti from Sri Lanka. For Visakha Puja Day 2003 - 2005, she led the Prayers of the Scriptures for the Ministry of Industry in Sanam Luang for the first time in Thailand and propagated the Paramattha Anuthara Sammasambhodhi and distributed food for people. Since 2000 to 2011, she traveled with the Sikkha Dhamma Group to propagate Paramattha Anuthara Sammasambhodhi in Scandinavia: Norway, Sweden, Denmark, Finland. In Europe: Russia, UK, France, Belgium, Switzerland, Spain. In Asia: Japan, Laos, China, Tibet, Mongolia, India, Sri Lanka. In 2006 and 2011, she was the Director of Construction of the Abhidhamma Bhuddha Vihara Saint Petersburg Temple, Russia and the Bhikkhuni Patimoka Dhammabhidok Temple, Yasothorn, Thailand. In 2013, she traveled with a group to propagate the Buddha’s words according to Paramattha Anuthara Sammasambhodhi in the UK and Scotland. She also travelled to Sri Lanka, and met the President of Sri Lanka. She negotiated to open the Dhamma path on Jaffna Island for Anuthara Sammasambhodhi, and her group subsequently met the Prime Minister of Sri Lanka. Then she travelled to Cambodia to chant for the deceased King Norodom Sihanouk upon invitation from Samdech Preah Mohesy Norodom Monineath Sihanouk. From 2014 – 2016, Bhikkhuni Natta Vivatta lead dialogue and discussion regarding the Tipitaka with Bhikkhunis from around the world at Berkeley, and San Francisco, USA. In 2015, she travelled to the Buddha Magga Puja Ceremony in Mumbai, Aurangabad, India for the ordination of 100 Samaneris.